The Riviera Maya is located on the Caribbean coast of the Yucatan Peninsula in the state of Quintana Roo, Mexico. Akumal Villas represents 40 vacation rentals located in the Riviera Maya between Puerto Aventuras and Tankah Bay near Tulum. For the most comprehensive maps of the Rivera Maya and the Yucatan, please click this MAPLINK and it will tak you to the best map source for local maps! Akumal is 96 kilometers or a 1.5 hour drive south of Cancun. 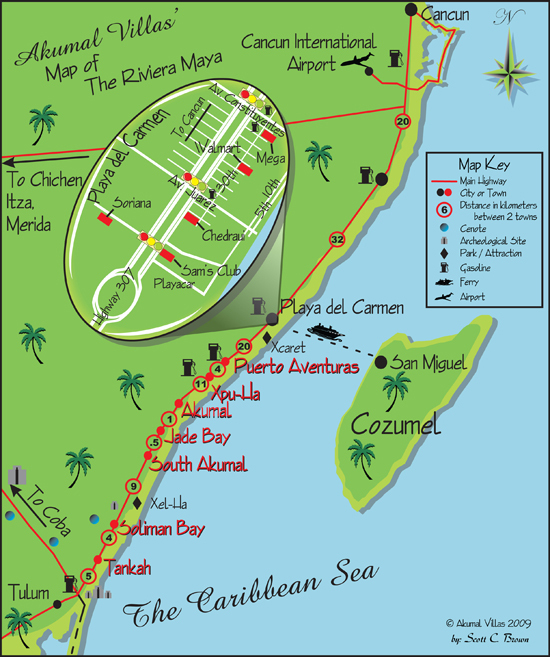 Playa del Carmen is about 37 kilometers north and Puerto Aventuras is 17 km north of Akumal. Soliman Bay and Tankah Bay are about 20 kilometers south of Akumal. And Tulum is 26 kilometers south of Akumal. Akumal includes several bays. Akumal Bay is the hub of the town, where you'll find shops, restaurants and amenities. Jade Bay is roughly 1.6 kilometers south of Akumal Bay and South Akumal is approximately 2 kilometers south. And Half Moon Bay and Yal-Ku Lagoon are located just north of Akumal Bay. If you have a moment and want to get familiar with where the villas are located in relation to each other and to stores and restaurants, click on the region names and follow the link to see a map of villas in that area. This map is interactive. Please click on the Area Name for further detail.